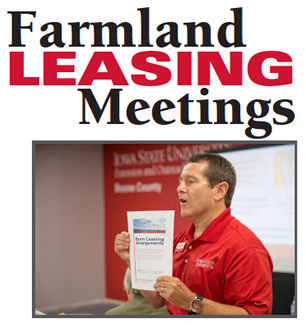 A Iowa State University Extension and Outreach will host multiple farmland leasing meetings during July and August at various times and locations throughout Iowa. The annual meetings are offered to address questions that land owners, tenants or other interested individuals have about leasing farmland. Core components of the 2018 program will include a focus on farmland ownership and tenure in Iowa, the latest on the economics of cover crop research and discussion on implementing conservation practices in leases, land values and cash rent trends, cost of production, methods for determining a fair rental rate, the latest legal updates that impact farm leases and land ownership and communication between tenants or landlords. Additional topics vary by location. The three-hour workshop is designed to assist landowners, farm tenants and other agri-business professionals with current issues related to farmland ownership, management and leasing arrangements. Attendees will gain a better understanding of current cash rental rate surveys and factors driving next year’s rents such as market trends and input costs. Comments from past participants highlight the value of the materials provided and depth of information covered in the short program. A 100-page workbook is compiled for the programs, with resources regarding land leasing agreements such as surveys, sample written lease agreements and termination forms, along with many other publications. The leasing meetings being held across Iowa are facilitated by ISU Extension and Outreach farm management specialists. A listing of ISU Extension and Outreach county offices hosting meetings is available online with additional information available through the Ag Decision Maker website. For registration information, contact the local ISU Extension and Outreach county office. Pre-registration is encouraged as an additional $5 fee may be added if registering less than two calendar days before the meeting date. The Ag Decision Maker leasing section also provides useful materials for negotiating leases, information on various types of leases, lease forms and newly updated Decision Tools.